There may have been a time when comedy fans could only identify Glen Foster as "that Canadian guy," but he's been around long enough that now everyone knows his name. But he still goes by "That Canadian Guy". It's called branding, folks. In this episode, Glen talks about being the oldest guy in the room, being perceived as a right winger, human rights tribunals and words of wisdom to young comics. Check it out here and now. Or download the episode at iTunes. Ask for What's So Funny? Tell them I sent you. We've had Baron Vaughn scheduled in tonight's spot for the past few weeks. But old friend Darryl Lenox is back in town and asked if he could come on and co-host with me. How could I refuse? Since the Vaughn episode is pre-recorded, we can just slot it in next week. We can make it happen. So let's do this. Lenox is an American comic who lived in Vancouver for 14 years before being unceremoniously deported from the country he loved for not having his papers. Now he's living in New York but still makes it back to play Vancouver at least once a year. Darryl chose as our guest Paula Antil, whose been doing comedy in Vancouver for years. They go way back. We'll find out what's what with both of them and see what Darryl has up his sleeves for his guest. Ari Shaffir was once a pious young seminary student. Now look at him, eating bacon and turning off lights willy-nilly. In this wide-ranging (read: long) episode, Ari talks about losing his religion. Other topics under discussion: a recent review of his act by the host, faking it in stand-up, and skepticism. Lots to chew on, but it's completely kosher so don't worry. Listen here and now or pack up your belongings and head on over to iTunes and download the episode there for more convenient listening options. Legendary comedian and heralded podcaster MARC MARON announces the release of the ‘WTF WITH MARC MARON’ box set. The two-disc set, packaged in die-cut limited edition release of 1,000 copies, includes the first 100 episodes of Maron’s phenomenal podcast which has been called “Required Listening” by the likes of New York Magazine, New York Times, Huffington Post, Vanity Fair, and GQ, and “A fascinating hour” by Entertainment Weekly. With over 100 hours of content, the WTF box set features Maron’s compelling, in-depth interviews with Ben Stiller, Robin Williams, Zach Galifianakis, Dane Cook, Sarah Silverman, Patton Oswalt and the now-infamous two-part interview with Carlos Mencia, plus many more classic WTFs featuring the top entertainers working today. In addition to audio files of the first 100 WTF episodes, the ‘WTF With Marc Maron’ box set includes video of WTF Live taped at The Bell House in Brooklyn (WTF Episode 213). The live show features Maron with an all-star guest line up which includes Artie Lange, Morgan Spurlock, Ira Glass, Elna Baker, Nick DiPaolo, Nick Griffin, Joe Mande, and Wayne Koestenbaum onstage in Fall 2011. ASPECIALTHING RECORDS is a Los Angeles-based independent comedy record label owned and operated by Matt Belknap and Ryan McManemin. Stemming from an online message board, aspecialthing records has taken a D.I.Y. approach to producing and distributing the finest stand-up comedy albums since 2006. Having already worked with such celebrated artists as Paul F. Tompkins, Doug Benson, Kyle Kinane, Greg Proops and Jen Kirkman, AST is looking forward to expanding their catalog while continuing their dedication to exceptional emerging and established comics. Tonight L.A.-based comic Ari Shaffir joins us for a wide-ranging discussion. How do I know? Well, because it's in the can, as we say in the business. He actually joined me a few weeks ago when he was in town performing at the Comedy MIX. Or, more truthfully, I joined him in his hotel room. But tonight is the airing of our one-hour and eighteen-minute conversation. We talked about my print review of his show, comedy camaraderie in Los Angeles, losing his religion, introverts, skepticism, and his podcast "Ari Shaffir's Skeptic Tank". Join us, won't you? As always, showtime is 11 pm, give or take a minute or two. 102.7 FM in Vancouver or livestream it at coopradio.org. Mark Breslin has forgotten more about comedy than most of us will ever know. But thankfully he hasn't forgotten too much, so he's still able to spin a yarn about the good ol' days. In this episode, he talked about giving Sam Kinison a bonus for completely walking the room, critiqued his own stand-up act, and ever-so-charmingly defended his iron-fisted rule over at Yuk Yuk's. And no matter what you think of it, he makes a compelling case. Have a listen. It's also available at iTunes, if that's how you roll. In the lull after your Easter repast, why not join us as we welcome Sunee Dhaliwal for his second visit to What's So Funny? Regular listeners will know what happened the first time: His car "broke down" so he did most of the show on the phone while screaming in from Abbotsford and managed to get to the studio for the last 15 minutes of the show. Tonight he promises to be there early. Either way, we're going on air at 11pm. We'll talk about his latest hand injury and all the TV work he's done lately. We'll get our basketball talk out of the way before airtime, don't you worry. In this most awkward of What's So Funny? episodes, Jay Brown and Patrick Maliha hash out their differences. Jay was in town from his Toronto home and I invited him to be a guest. But while here, he saw some things that riled him up about the Vancouver scene and decided to call Patrick on the carpet. The two have never been friends, but managed to come to a kind of truce by hour's end. I'm a little late getting to this one. And there's one more in the can that should be dropped sometime this week. Sorry about that. In this episode, first-timer Chris James explains how he keeps his slim figure and reveals he uses a stage name. Who knew? I'm sure many did, but I didn't. He also talked about his dreams and goals to pick up a new accent and how he doesn't get anything done because he's too busy trolling on Facebook. Have at it. 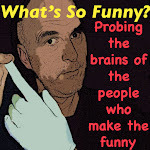 Listen here or subscribe to the What's So Funny? podcast on iTunes. I'm pretty sure you can do that. This is no April Fool's joke. We've got Papa Bear himself on the show tonight. Yes, Mark Breslin. You know, of Mark Breslin's Yuk Yuk's Comedy Clubs. Mark was in town last week to open up the new Vancouver club and he graciously agreed to come into our studio and record a show. The man has been around comedy since the mid-1970s, has many strong opinions on it, and knows how to communicate those thoughts and opinions effectively. Two of my favourite parts of tonight's episode are when he talks about his experiences with the late Sam Kinison and when the current Mark Breslin listens to the younger stand-up comic Mark Breslin and critiques him. But there's lots more to enjoy.